When you go hunting, layering seems to be raise many problems for some and not at all for others. The truth is that you need to layer according to your activity level and the weather conditions. Nowadays layering clothing has become the first method of staying warm on the coldest winter days. An efficient layering system contains three layers that insulate, absorb moisture and protect from the elements. This gives you a good base layer for warmth and comfort, the middle layer for warmth and the outer layer for wind and water protection. 0.1 What type of layer do you want? 0.2 What to look for on a base layer for hunting? What type of layer do you want? Different types of activities require different types of base layers. Some are designed to be worn only as base layers, whereas some may be worn on their own after getting rid of the outer layers when the weather gets too hot. Your base layer slips on and off easily thanks to the smooth outer fibers and the textured outer fibers are good on retaining heat. You can choose from short to long-sleeve styles, mock, hooded and there are some even with zipper options. Women can choose the base layers for hunting especially created for them, for a better fit. There are base layers for everyday use and the ones for hunting are more specific and come with many other features. 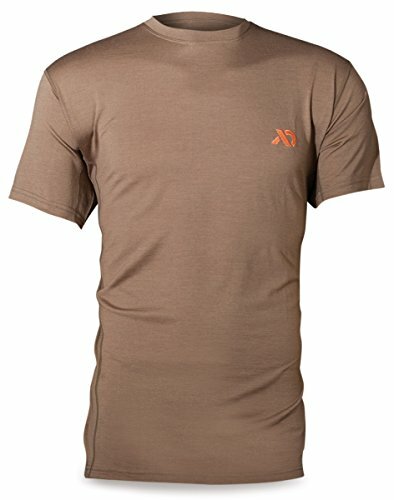 What to look for on a base layer for hunting? The fabric of your base layer is a personal choice, as you know best why you are buying it for. If you go for a woolen base layer keep in mind that this is flexible and long lasting. Merino wool keeps you cold when it’s hot outside and warm in the coldest winter as wool is a great traditional insulator. Wool repels small amounts of liquid on the surface and wicks moisture for the skins. On the other hand, wool gets saturated pretty fast and fails on dissipating as well as synthetics the moisture. Wool is naturally resistant to odor and flame retardant at the same time. Keep in mind to take extra care for your woolen base layer as it needs special washing procedures. A silk base layer feels smooth to touch, soft and silk is strong and abrasion-resistant. If you know you’re going to get extremely physical, avoid silk as it’s highly absorbent. There are special treatments to maximize moisture-wicking ability of the skin, so problem solved. You can hand and machine wash the silk. If your base layer is made of polyester or other synthetic fabric you know you have a winner. This kind of fabric is long lasting, lightweight, easy to take care of and dries quickly. On the plus, this fabric resists stretching and shrinking, but doesn’t have a natural feeling against your skin. Extremely breathable, wicking moisture and keeping you warm at the same time, polyester lacks the softness, but it’s the easiest to take care for. The weight of the fabric of your base layer is also important. A lightweight base layer is the best choice when your activity is intense on a cold weather or it’s a low profile in a cool weather. The most versatile fabrics are the midweight ones as they give great performance on many kinds of activities in a cold weather. For the maximum of insulation, in low activity levels in cold weather, go for the heavyweight base layers. Polar weight is the no.1 when it comes to warmth and is fleeced on both sides. Avoid this kind of layers on high-movement activities as they might make you too hot and…sweat a lot. Your base layer needs a good performance when it comes to moisture wicking. Your perspiration needs to be taken away from the skin to the outer layer in order to evaporate. This is done by the wicking fibers of your base layer, in case it’s a good one, anyway. The base layer for hunting is supposed also to be good at body mapping, which means to simply regulate the temperature only where it’s needed. If you get a four-way stretch base layer, then you got the best one. Stretching in all directions means freedom on the move for you. The Scent Control feature is necessary on a base layer for hunting. The antimicrobial feature adds up so that the base layer may prevent the odor bacteria growth, keeping you fresh all of your hunting. Quiet and non-itchy are also important for your base layer for hunting. Last thing you want when pulling the trigger is to …scratch and make a noise. As we stated before, Merino wool is a great choice for a base layer for hunting, but what if you could have that in a short sleeve base layer? This First Lite Merino Wool Llano Short Sleeve Crew does what Merino wool knows best: keeps you warm in the winter and cools you in the hot summer. Despite all this, this is a great investment of your money anytime. 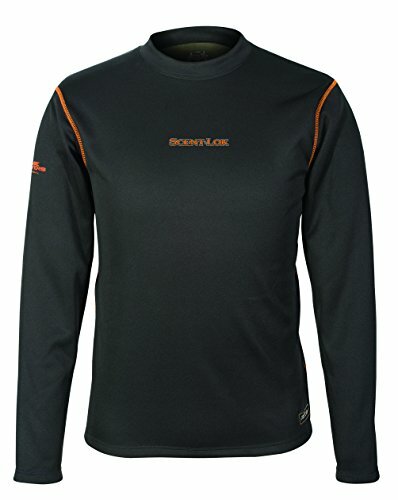 If you go for the high quality Polyester base layer, a good choice is this Scent-Lok Men’s Thermal Baseslayer Top. All in all, this polyester base layer is still a great buy when in search for a good base layer for hunting. On the other side, we need to mention the parts we didn’t like. If you plan to take this on a very cold winter, think twice as this might not be the best choice. 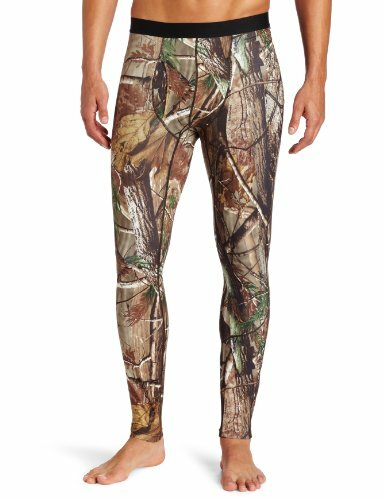 When we talk about base layer for hunting, we need to talk also about bottoms. And if Merino wool sounds a bit too fancy and too complicated to take care of for your, then these Columbia Men’s PHG Camo Midweight Tight Base Layer are the best next thing. But, considering the price and the high performances, you won’t be buying a lemon for sure when getting these as your base layer for hunting. If you are determined to only invest once in a good pair of bottoms, then this First Lite Allegheny Merino Wool Bottoms is the perfect choice. But, as they are made of the finest Merino wool and are so long lasting, these bottoms are a purchase you can’t go wrong with.